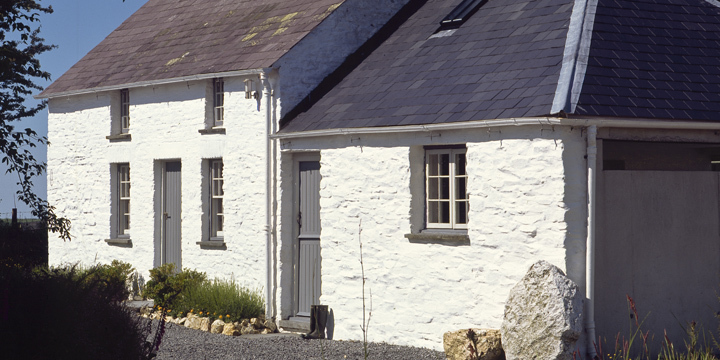 All reservations and bookings for Bryncyn are managed by Under The Thatch. Click below to check availability and pricing. Profiled in both Cereal and World of Interiors magazines, Bryncyn is a small, luxurious white cottage with a minimalist interior where tradition meets glass & concrete. It stands at the end of a track on the edge of the tiny Welsh village of Tanglwst overlooking the Preseli Mountains. Beyond the traditional stone façade the ground floor has been opened up into one long, airy space with small windows and a vast contemporary fireplace. The room is simply furnished with an upholstered settle, a Mies van der Rohe 'Barcelona' chair and a double bed tucked in the corner. Upstairs the bones of the building are left bare to create a spacious master bedroom with pale lime-washed walls and an open ceiling. From the living room a slate step, worn by generations of use leads to an extension which looks to early 20th century Modernism in its detailing. From the step a thin line of glass at the top of the concrete wall frames the landscape beyond. The kitchen back wall is one vast sliding glass door which leads onto a terrace partially enclosed by concrete walls with ingenious floating beams and a sunken cedar hot-tub. Master double bed upstairs with additional two single beds. Double bed tucked in corner of Living room. Double bed above kitchen (restricted headroom and access by fixed ladder). Open plan with wood-burning stove and seating. Former cowshed converted to kitchen with large table with a range of appliances. Ground floor with shower and modern fittings. Sliding glass door in kitchen opens onto terrace outside with concealed sunken cedar hot-tub. The nearest train station is Carmarthen which is 14 miles away. Minimalist interior with fewer modern conveniences. Features like steps, access ladder, restricted headroom and a small bathroom might cause access or mobility issues. Access to bedroom 3 (above kitchen) is by a steep fixed ladder. A starter basket of logs is provided for the wood burner but we recommend that you bring additional supplies of logs/coal. Bryncyn has been featured in the following publications and on the following websites.